As I see it, the Fed’s open-market operations have produced more spending–hence higher capacity utilization–and lower interest rates–has more advantageous costs of finance–and we are supposed to believe that its policies “have hurt business investment”?!?! 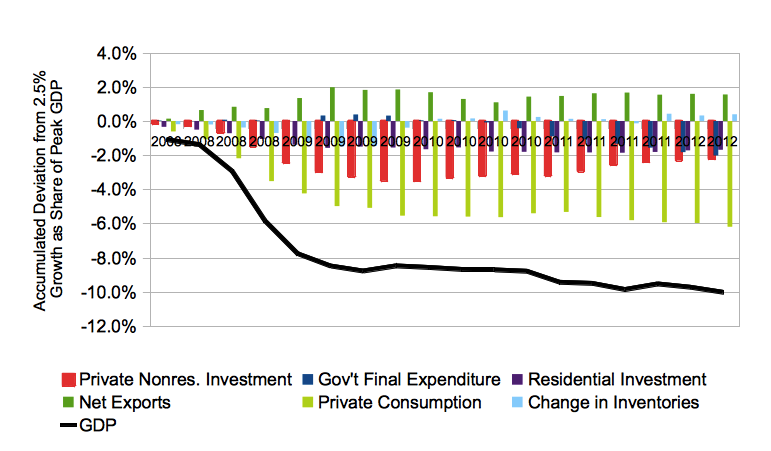 … As I have said before and say again, weakness in overall investment is 100% due to weakness in housing investment. 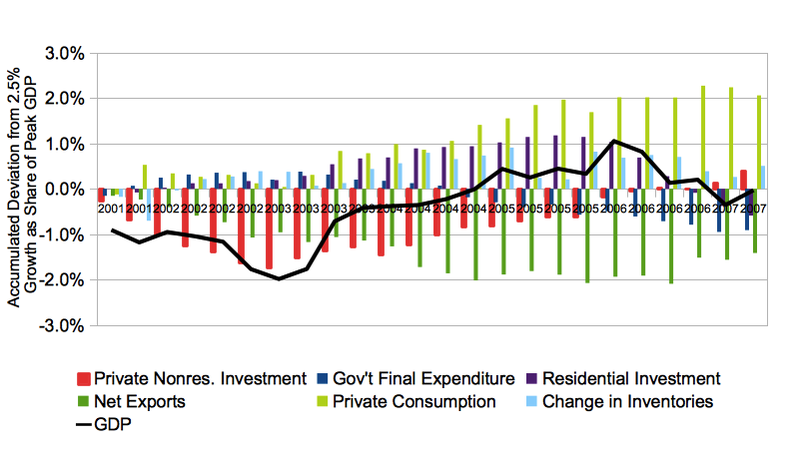 Is there an argument here that QE has reduced housing investment? No. Is nonresidential fixed investment below where one would expect it to be given that the overall recovery has been disappointing and capacity utilization is not high? As evidence, DeLong points to the fact that nonresidential investment as a share of GDP is back where it was at the last two business cycle peaks. As it happens, I agree with DeLong that it’s hard to make a convincing case that unconventional monetary policy is holding back business investment. Arguments about the awfulness of low interest rates seem more political or ideological, based on the real or imagined interests of interest-receivers than any identifiable economic analysis. But there’s a danger of overselling the opposite case. More importantly, using potential GDP as the yardstick is misleading because potential GDP is calculated simply as a trend of actual GDP, with a heavier weight on more recent observations. By construction, it is impossible for actual GDP to remain below potential for an extended period. So the fact that the current recovery is weak by historical standards automatically pulls down potential GDP, and makes the relative performance of investment look good. We usually think that investment spending the single most important factor in business-cycle fluctuations. If weak investment growth results in a lower overall level of economic activity, investment as a share of GDP will look higher. Conversely, an investment boom that leads to rapid growth of the economy may not show up as an especially high investment share of GDP. So to get a clear sense of the performance of business investment, its better to look at the real growth of investment spending over a full business cycle, measured in inflation-adjusted dollars, not in percent of GDP. And when we do this, we see that the investment performance of the most recent cycle is the weakest on record — even using the BEA’s newer, more generous definition of investment. 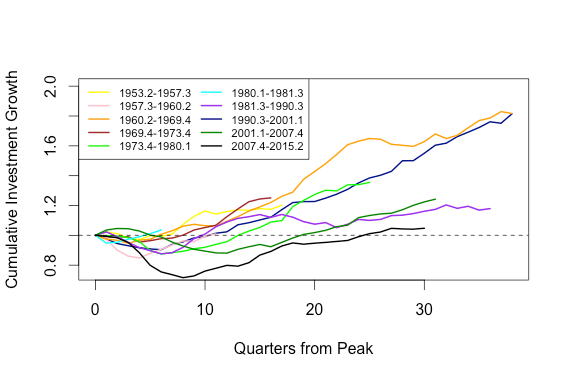 The figure above shows the cumulative change in real investment spending since the previous business-cycle peak, using the current (broad) BEA definition. The next figure shows the same thing, but for the older, narrower GAAP definition. 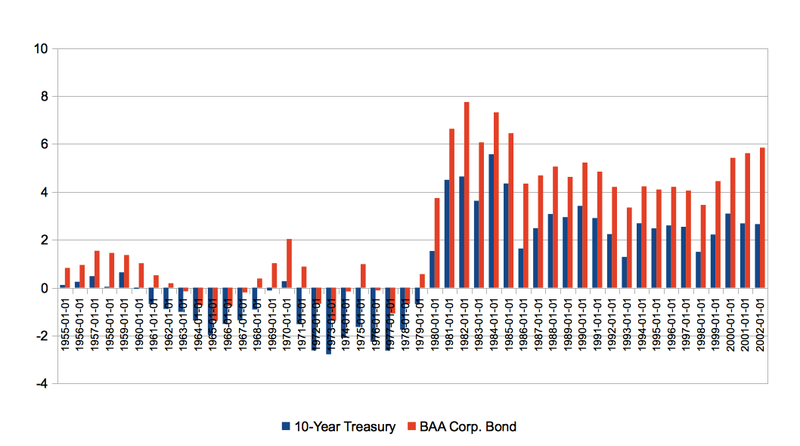 Data for both figures is taken from the aggregates published by the BEA, so it includes closely held corporations as well as publicly-traded ones. 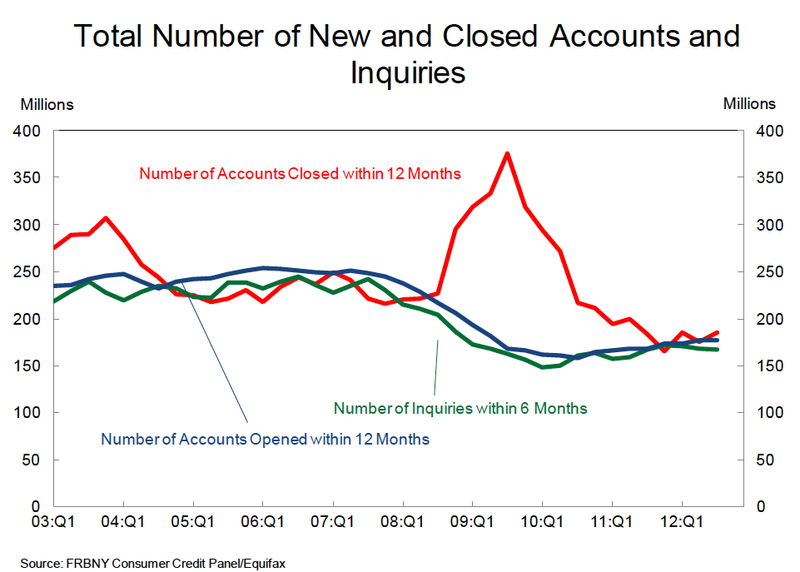 As the figures show, the most recent cycle is a clear outlier, both for the depth and duration of the fall in investment during the downturn itself, and even more for the slowness of the subsequent recovery. Even using the BEA’s more generous definition, it took over 5 years for inflation-adjusted investment spending to recover its previous peak. (By the narrower GAAP definition, it took six years.) Five years after the average postwar business cycle peak, BEA investment spending had already risen 20 percent in real terms. As of the second quarter of 2015 — seven-and-a-half years after the most recent peak, and six years into the recovery — broad investment spending was up only 10 percent from its previous peak. (GAAP investment spending was up just 8.5 percent.) In the four previous postwar recoveries that lasted this long, real investment spending was up 63, 24, 56, and 21 percent respectively. So the current cycle has had less than half the investment growth of the weakest previous cycle. And it’s worth noting that the next two weakest investment performances of the ten postwar cycles came in the 1980s and the 2000s. In recent years, only the tech-boom period of the 1990s has matched the consistent investment growth of the 1950s, 1960s and 1970s. So I don’t think it’s time to hang the “Mission Accomplished” banner up on Maiden Lane quite yet. As DeLong says, it’s not surprising that business investment is weak given how far output is below trend. But the whole point of monetary policy is to stabilize output. For monetary policy to work, it needs to able to reliably offset lower than normal spending in other areas with stronger than normal investment spending. If after six years of extraordinarily stimulative monetary policy (and extraordinarily high corporate profits), business investment is just “where one would expect given that the overall recovery has been disappointing,” that’s a sign of failure, not success. Another minor issue, which I can’t discuss now, is DeLong’s choice to compare “real” (inflation-adjusted) spending to “real” GDP, rather than the more usual ratio of nominal values. Since the price index for investment goods consistent rises more slowly than the index for GDP as a whole, this makes current investment spending look higher relative to past investment spending. This IP spending is not generally counted as investment in the GAAP accounting rules followed by private businesses. As I’ve mentioned before, it’s problematic that national accounts diverge from private accounts this way. It seems to be part of a troubling trend of national accounts being colonized by economic theory. 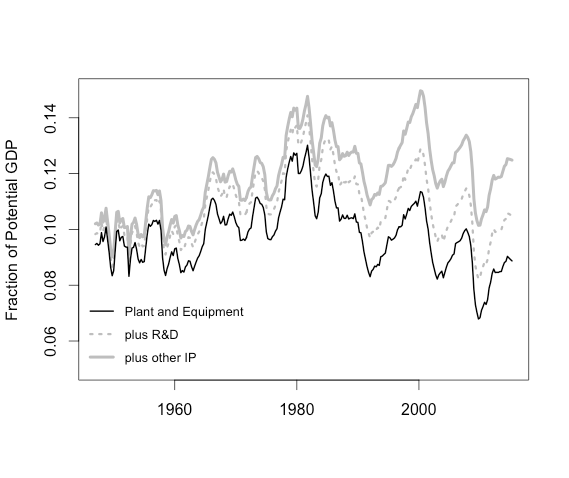 R&D spending is at least reported in financial statements, though I’m not sure how consistently. But with the other new types of IP investment — which account for the majority of it — the BEA has invented a category that doesn’t exist in business accounts at all. So the historical numbers must involve more than usual amount degree of guesswork. Posted on October 28, 2015 October 28, 2015 Tags anatomy of DeLongism, interest rates, investment, macroeconomic history, macroeconomics, monetary policy, the continuing crisis12 Comments on How Strong Is Business Investment, Really? 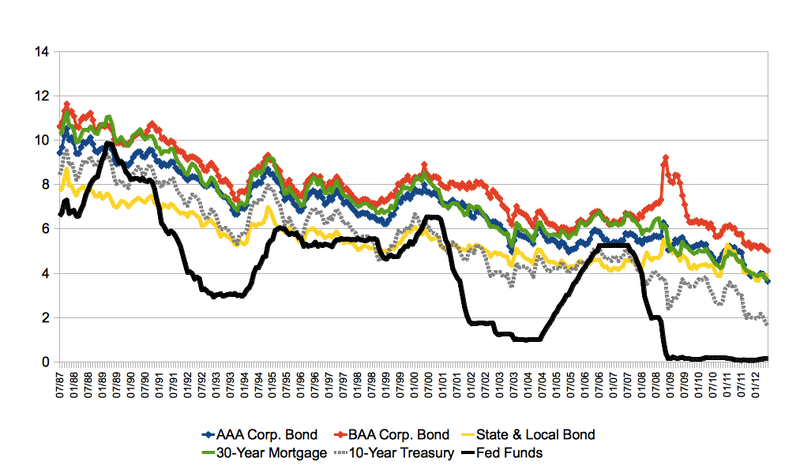 Are Recessions All About Money? There is a view that seems to be hegemonic among liberal economists, that recessions are fundamentally about money or finance. Not just causally, not just in general, but always, by definition. In this view, the only sense in which one can speak about aggregate demand as a constraint on output, is if we can identify excess demand for some non-produced financial asset. In the simplest case, people want to hold a stock of money in some proportion to their total income. Money is produced only by the government. Now suppose people’s demand for money rises, and the government fails to increase supply accordingly. You might expect the price of money to rise — that is, deflation. But deflation doesn’t restore equilibrium, either because prices are sticky (i.e., deflation can’t happen, or not fast enough), or because deflation itself further raises the demand for money. It might do this by raising precautionary demand, since falling prices make it likely that businesses and households won’t be able to meet obligations fixed in money terms and will face bankruptcy (Irving Fisher’s debt-deflation cycle). Or deflation might increase demand for money by because it redistributes income from net borrowers to net savers, and the latter have a higher marginal demand for money holdings. Or there could be other reasons. In any case, the price of money doesn’t adjust, so government has to keep its quantity growing at the appropriate rate instead. From this perspective, if we ever see an economy operating bellow full capacity, it is true by definition that there is excess demand for some money-like asset. How, exactly, should economists characterize the excess demand in financial markets? Where was it, exactly? That became a subject of running dispute, and the dispute has been running for more than 150 years, with different economists placing the cause of the “general glut” that was excess supply of newly-produced goods and of labor at the door of different parts of the financial system. Wicksell-Keynes (Keynes of the Treatise on Money, that is): a depression happens when there is an excess demand for bonds… You fix a depression by either reducing the market rate of interest (via expansionary monetary policy) or raising the natural rate of interest (via expansionary fiscal policy) in order to bring them back into equality…. Bagehot-Minsky-Kindleberger: a depression happens because of a panic and a flight to quality, as everybody tries to sell their risky assets and cuts back on their spending in order to try to shift their portfolio in the direction of safe, high-quality assets… You fix a depression by restoring market confidence and so shrinking demand for AAA assets and by increasing the supply of AAA assets…. That’s an admirably clear statement. But is it right? I mean, first, is it right that demand constraints can always and only be usefully characterized as excess demand for some financial asset? And second, is that really what the General Theory says? The first answer is No. Or rather, it’s true but misleading. It is hard to talk sensibly about a “general glut” of currently produced goods except in terms of an excess demand for some money-like financial asset. 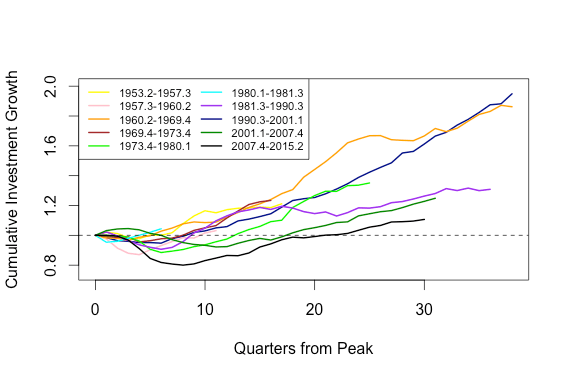 But recessions and depressions are not mainly characterized by a glut of currently produced goods. They are characterized by an excess of productive capacity. Markets for all currently-produced goods may clear. But there is still a demand constraint, in the sense that if desired expenditure were higher, aggregate output would be higher. The simple Keynesian cross we teach in the second week of undergrad macro is a model of just such an economy, which makes sense without money or any other financial asset. (And is probably more useful than most of what gets taught in graduate courses.) Arguably, this is the normal state of modern capitalist economies. Meanwhile, how about the second question — in the General Theory, did Keynes see demand constraints as being fundamentally about excess demand for money or some other financial asset, with the solution being to change the relative price of currently produced goods, and that asset? Again, the answer is No. The fact that a collapse in the marginal efficiency of capital tends to be associated with a rise in the rate of interest may seriously aggravate the decline in investment. But the essence of the situation is to be found, nevertheless, in the collapse of the marginal efficiency of capital… Liquidity preference, except those manifestations which are associated with increasing trade and speculation, does not increase until after the collapse in the marginal efficiency of capital. It is this, indeed, which renders the slump so intractable. 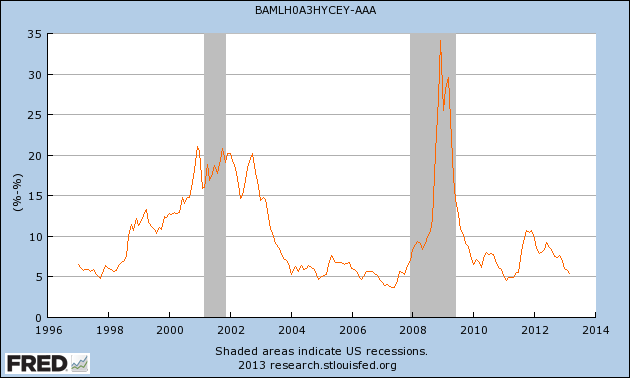 Later on, a decline in the rate of interest will be a great aid to recovery and probably a necessary condition of it. But for the moment, the collapse in the marginal efficiency of capital may be so complete that no practicable reduction in the rate of interest will be enough [to offset it]. If the reduction in the rate of interest was capable of proving an effective remedy by itself, it might be possible to achieve a recovery without the elapse of any considerable interval of time and by means more or less directly under the control of the monetary authority. But in fact, this is not usually the case. In this sense, Keynes agrees with the Real Business Cycle theorists that the cause of a decline in output is not fundamentally located in the financial system, but a fall in the expected profitability of new investment. The difference is that RBC thinks a decline in expected profitability must be due to genuine new information about the true value of future profits. Keynes on the other hand thinks there is no true expected value in that sense, and that our belief about the future are basically irrational. (“Enterprise only pretends to itself to be actuated by the statements in its prospectus … only a little more than an expedition to the South Pole, is it based on an exact calculation of benefits to come.”) This is an important difference. But the key point here is the bolded sentences. Keynes considers DeLong’s view that the fundamental cause of a downturn is an autonomous increase in demand for safe or liquid assets, and explicitly rejects it. The most stable, and least easily shifted, element in our contemporary economy has been hitherto, and may prove to be in the future, the minimum rate of interest acceptable to the generality of wealthowners. (Cf. the nineteenth-century saying quoted by Bagehot, that “John Bull can stand many things, but he cannot stand 2 percent.”) If a tolerable level of employment requires a rate of interest much below the average rates which ruled in the nineteenth century, it is most doubtful whether it can be achieved merely by manipulating the quantity of money. This is an important part of the argument, but it tends to get ignored by mainstream Keynesians, who assume that monetary authority can reliably set “the” interest rate. But as we see clearly today, this is not a good assumption to make. Well before the policy rate reached zero, it had become effectively disconnected from the rates facing business borrowers. And of course the hurdle rate from the point of view of the decisionmakers at a firm considering new investment isn’t just the market interest rate, but that rate plus some additional premium reflecting what Keynes (and later Minsky) calls borrower’s risk. Of course, DeLong could be misrepresenting Keynes and still be right about economic reality. But we need to at least recognize that aggregate demand is logically separate from the idea of a general glut; that the former, unlike the latter, does not necessarily involve excess demand for any financial asset; and that in practice supply and demand conditions in financial markets are not always the most important or reliable influences on aggregate demand. Keynes, at least, didn’t think so. And he was a smart guy. The other point, to anticipate a possible objection, is that the investment decision does not involve allocation of a fixed stock of savings between capital goods and financial assets. The undoubted effectiveness of monetary policy in the postwar decades might seem to argue against this point. But it’s important to recognize — though Keynes himself didn’t anticipate this — that in practice monetary policy has operated largely though its effect on the housing market, not on investment. Posted on August 31, 2011 May 14, 2015 Tags anatomy of DeLongism, Keynes, macroeconomics12 Comments on Are Recessions All About Money? everything we’re seeing makes sense if you think of the Right as representing the interests of rentiers, of creditors who have claims from the past — bonds, loans, cash — as opposed to people actually trying to make a living through producing stuff. Deflation is hell for workers and business owners, but it’s heaven for creditors. … thinking of what’s happening as the rule of rentiers, who are getting their interests served at the expense of the real economy, helps make sense of the situation. EDIT: It’s interesting to note how reflexively DeLong shied away from this thought when it occurred to him a while back, with the ludicrous-on-its-face argument that only “coupon-clippers with their portfolios 100% in government bonds” could have an interest in deflation. The existence of rentiers as a distinct social class is an unthought in respectable circles. Which shows how impressively disrespectable Krugman is becoming. This may be the answer to this. It is perfectly obvious that the cause of the Great Recession was an insufficient supply of government debt. And it is perfectly obvious that we need to reduce the supply of government debt. Let me spoil the joke by explaining it. The argument that the collapse in demand for currently produced goods and services in 2007-2009 was due to an excess demand for AAA assets, i.e. government debt, is a useful one, as far as it goes. But the strange thing is that the New Keynesians making it don’t seem to think it conveys any information about the long-term fiscal position. Presumably, if we’d known about the coming excess demand for government debt, we’d have wanted higher deficits throughout the 2000s, instead of having to ramp them up suddenly at the end of the decade. And presumably, the circumstances that led to higher demand for government debt in 2007-2009 can be expected to recur. So maybe we want to prepare for them going forward? But no, we still need the debt-GDP ratio to be “sustainable” — a term which is never defined, except it’s always lower than where we are now. The fact that the ratio was too low, rather than too high, in the recent past somehow fails to imply that it could be too low, rather than too high, in the future. Let me come at this another way. Check out the entrants in the Peterson Institute budget beauty contest. All of them are considered by the judges to have rocked the swimsuit competition “put the federal debt on a sustainable trajectory through 2035.” But what does this mean? The fiscal positions at the end date range from a surplus of 0.8% of GDP to a deficit of 3.7%. Debt-GDP ratios range from 30% to 81.7%. The highest-deficit entrant (EPI’s, for what it’s worth) is near the very high end of the historical range, and essentially identical to the CBO’s current-policy baseline. If current policy is sustainable, why are we having this conversation? But of course, Peterson gives no indication how “sustainable” is being defined (or for that matter what they’re assuming about GDP growth and the interest rate on government debt, quite important for these exercises). Mainstream discourse on budget deficits (as with inflation) combines an absolute conviction that the current debt-GDP ratio is too high, with a complete lack of principles for telling us what the optimal ratio might be.